She’s a mum and nothing pleases her more than to see her family enjoying her food. Naturally, Kak Shikeen was all smiles at the recent preview of the Masakan Bonda Kembali buffet that will roll out from May 10 to June 2. Checker’s Café will feature her 13 signature recipes including Rendang Ayam Minang, Johor Pajeri Nenas, Ikan Bakar and Daging Salai Lemak Cili as well as the various kerabu. Located on the 1st floor of Dorsett Kuala Lumpur in Jalan Imbi, the café showcases action stations along one side while island counters are filled with salad, fruit and hot dishes. Drinks are aplenty, with urns of hot coffee and teh tarik (pulled tea) as well as iced juices (apple, sugar cane, dates and rose syrup bandung). 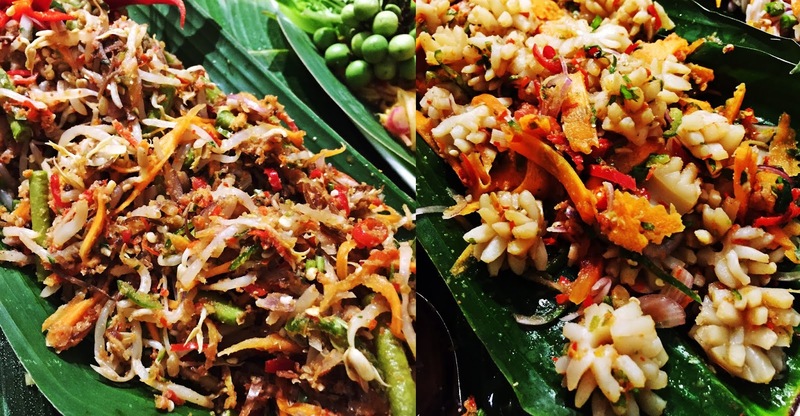 The ulam-ulam comes with a selection of sambal dips and there’s piquant kerabu (Malay salads) as well, such as sotong (squid) kerabu, glass noodle kerabu, mango kerabu, pucuk paku (fernhead) kerabu and surprisingly appetising beansprout kerabu. For the holy month, it’s not just mum’s cooking that appeals. Must-haves include bubur lambuk (spiced congee), satay, lemang, ketupat and ketupat palas with serunding (meat floss). These staples will be available daily. Satay is always popular, with the various condiments of peanut sauce, cucumber, onion and ketupat. Roasted lamb is always a crowd pleaser. But instead of a whole roasted lamb, the chefs have paired roasted leg of lamb with Nasi Arab, a rice dish cooked with tomato, hard-boiled egg, raisin and cashew nut. While good enough to stand on its own, this rice is a perfect accompaniment to the succulent cut of lamb, carved at the table. Next to this is Kak Shikeen’s Gulai Kawah Asam Pedas Tetal, kept hot in the large wok, next to the Noodles Station. There’s always a choice of two types of noodles. For the occasion, it’s Asam Laksa Penang and Mee Curry. I opt for the latter, a bowl of steaming noodles and condiments in an aromatic gravy. On the other side of Nasi Arab is Ikan Bakar, grilled whole barramundi with a spicy gravy. The sweetness of the fish is enhanced by the spices. Do try the Roti John too. Meanwhile, at the mains table, rows of delectable curries and other dishes beckon. There is soup: Tofu and French onion. I prefer the latter, served with croutons and rich in flavour of softly braised onions. I am undecided initially about the mushy looking Sambal Bilis Tempoyak & Petai. I take a hesitant spoonful and it’s delightfully creamy and rich in durian aroma. Crunchy sliced petai and ikan bilis are cooked with shredded tapioca leaves, hence the mushy appearance. Another unassuming-looking dish is Tempe Berlada, with sliced fermented soya beans tossed in sambal with ikan bilis and peanuts. There are meaty offerings such as Opor Kambing, Rendang Ayam Minang, Paru Goreng Bercili and Daging Salai Lemak Chilli Padi as well as seafood, from Sambal Udang to Patin Asam Rebus Tempoyak, Indian-style Fish Head Curry. All these are best when eaten with plain steamed rice, lemang or ketupat. At the entrance to the café is a popcorn cart and stalls set up for Goreng-Goreng (fritters), with banana, yam, sweet potato and cempedak. On the other side, clay pots are filled with hot desserts – black glutinous rice, banana pengat and Serawa Durian (Kak Shikeen’s home specialties) to go with steamed sweet glutinous rice cakes. But wait. 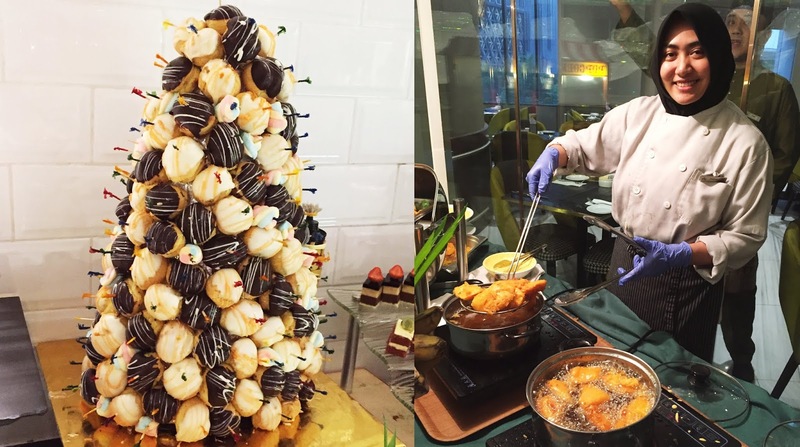 There are plenty other desserts, from fresh fruit and colourful kuih muih (such as Lepat Pisang, Kuih Talam) to cake, pudding, cream puff, ice cream with toppings and ais kacang (shaved ice) with condiments. The variety is boggling and I also see sago gula Melaka, badak berendam, meringue Swiss roll and a chocolate fountain with brownies and marshmallow. RM88 nett per person before May 9.